Jain Cabbage Pakoda – deep-fried fritters made from fresh cabbage, gram flour and spices without Onion or Garlic. It’s a perfect evening snack, especially during monsoon season. The recipe for Jain Cabbage Pakora/Cabbage Fritters is very easy & quick to prepare. 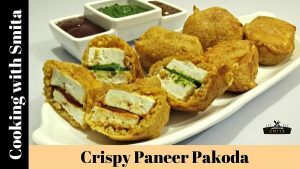 Follow this test recipe & video tutorial (below) to make crispy & delicious Pakodas at home. Roughly chop Cabbage leaves (check instructions in the video below) and place in a large bowl. Add Coriander and Green Chillies. Add freshly grated Ginger; it’s an optional ingredient, you can skip but believe me it adds exquisite taste in Cabbage Pakodas. Now add Asafoetida, Black Pepper powder and Besan. The quantity of Besan depends on moisture released from freshly chopped Cabbage. Finally, add Sugar, Red Chilli Powder, Salt and Lemon Juice. Mix well all the ingredients, make sure all Cabbage leaves are coated well with Besan. Do not add water, moisture released from cabbage is enough to make the batter. After 10 minutes, add Besan as required and prepare the batter. Heat oil in a pan over medium-high flame. Deep fry Pakodas until they turn golden brown and crisp. Place Pakodas on a paper towel to remove excess oil. 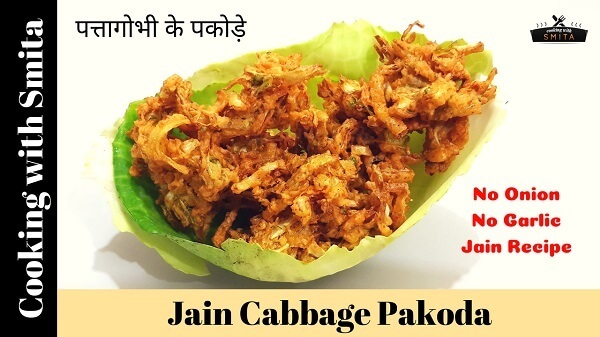 Serve Jain Cabbage Pakodas with Tomato Ketchup or Green Chutney.